Arkansas is highlighted in red on the map to the right. The State of Arkansas is bounded by Missouri on the north, by Louisiana on the south, by Tennessee on the east, and by Oklahoma on the west. It is bounded by Mississippi on the southeast, and by Texas on the southwest. Arkansas is the 27th largest state in the United States, covering a land area of 52,068 square miles (134,856 square kilometers). Although Arkansas contains 75 counties, only the city of Little Rock has more than 100,000 inhabitants. This Arkansas map site features road maps, topographical maps, and relief maps of Arkansas. The detailed, scrollable road map displays Arkansas counties, cities, and towns as well as Interstate, U.S., and Arkansas state highways. The pannable, scalable Arkansas street map can be zoomed in to show local streets and detailed imagery. to view a scalable Arkansas road map. The detailed Arkansas map and the regional Arkansas map display cities, roads, rivers, and lakes as well as terrain features. The detailed map shows only the State of Arkansas, while the regional map shows Arkansas and the surrounding region. Arkansas' capital city is Little Rock. Other major cities found on the Arkansas map include Fort Smith, Fayetteville, North Little Rock and Jonesboro. The state's primary industries include bauxite processing, timber, and chemicals. In 2005, the population of Arkansas was estimated at 2,775,708, which is about 53.4 people per square mile. In 2010, Arkansas' population rose to 2,915,918 people. The state's Interstate Highways include I-30, I-40, and I-55. The name Arkansas comes from a Native American word describing the Quapaw or Arkansaw tribe, meaning "people who live downstream". In southeastern Arkansas, the land is low and flat, affording good growing conditions for cotton, rice, and soybeans. Northwest of Little Rock, the higher ground of the Ozark Plateau gives way to hills and the Ouachita Mountains. The Arkansas River, and the state's other rivers, drain into the Mississippi. Hot Springs National Park, with its mineral water spas, is a popular Arkansas tourist destination. For additional Arkansas travel and tourism information, visit the official Arkansas tourism site and Arkansas Atlas. This online Arkansas reference map shows major cities, roads, railroads, and physical features in Arkansas. 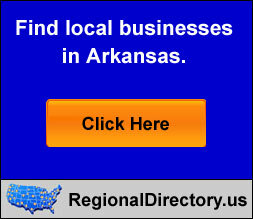 Several map publishing companies offer printed maps of Arkansas. For example, Omni Resources offers several maps of Arkansas that feature points of interest, airports, and parks, as well as selected local attractions and insets of major Arkansas cities. Arkansas-Map.org Editor, State Maps, PO Box 775, Barnegat, NJ 08005.